The major investigations in the diagnosis and monitoring of disorders of the immune system are described below. 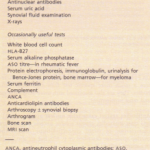 A characteristic feature of many autoimmune disorders is the presence of specific autoantibodies. These may be useful markers of disease activity, and in monitoring response to therapeutic inventions. This technique is used to detect organ- and tissuespecific antibodies, e.g. thyroid, adrenal, smooth muscle, gastric parietal cell, mitochondrial, acetylcholine receptor, antinulear, antineutrophil cytoplasm, glomerular basement membrane( methodology). This technique is used for the detection or rheumatoid factors (RF), in the rheumatoid arthritis haemagglutination assay (RAHA). Sheep red blood cells are coated with rabbit antibody. The results are usually expressed as a titre of the highest serum dilution that gives a positive result. These techniques are therefore only semi-quantitative. ELISA is a commonly used technique for the detection of a wide range of proteins. Wells of microtitre plates are coated with the antigen (e.g. neutrophil cytoplasm proteins, or double-stranded DNA) and the patient’s serum applied. Any antibody present will bind to the antigen. A second layer of anti-human antibody conjugated with an enzyme (often alkaline phosphatase) is added, as a ‘developing antibody’. A substrate that changes colour if the enzyme is present is added, and the colour intensity is measured spectrophotometrically. The intensity is proportional to the concentration of antibody present. The test is quantitative as the intensity of the reaction of the patient’s serum is compared to a standard curve plotted using a serum with known concentration of antibody. 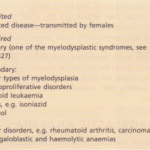 The major immunodeficiencies involve abnormalities in the cells of the immune system, for example T and B cells in SCID, DiGeorge syndrome, HIV infection, X-linked agammaglobulinaemia; phagocytes in chronic granulomatous disease. Fluorescent-labelled monoclonal antibodies to the surface protein of interest are applied to the cells. The cells can then be analysed by a flow cytometer. Commonly used antibodies are CD3 (all mature T lymphocytes), CD4 (CD4+ or ‘helper’ T-cells), CD8 (CD8+ or ‘suppressor’ T cells), CD19 or CD20 (mature B cells). Therefore, results have to be interpreted cautiously. Also, although AIDS characteristically causes CD4-cell depletion, it is important to realize that other conditions, such as tuberculosis and sarcoidosis, can cause similar findings, and that CD4 lymphopenia is not itself diagnostic of HIV infection. • Recall antigens such as purified protein derivative (ppd) and Candida. 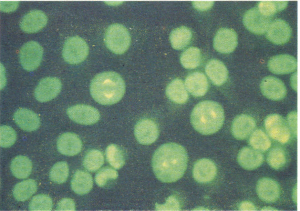 The resulting proliferation is detected by the uptake of the radio labelled thymidine into the DNA of the lymphocytes. Neutrophil function tests Tests of phagocytosis and intracellular killing/oxidative burst, random locomotion and chemotaxis are available in specialist centres.